On August 31, H.E. Mme. 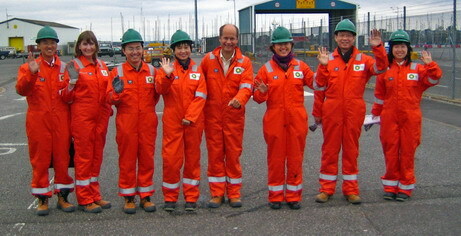 Ambassador Fu Ying visited Wytch Farm Oilfield of the British Petroleum (BP) at Dorset in southwest England. Mr. John Hughes, BP head of Asia Pacific and Ms. Suzie Baverstock, head of Environment and Communication Affairs, welcomed Fu Ying on behalf of BP and accompanied the visitors to Furzey Island in the oil extraction area. Seen at a distance, the island was covered by green trees and no oilfield equipments was in sight, going ahead along the path, the extraction facilities appeared from the surrounding of the trees. Ms. Suzie Baverstock introduced that as the extraction area lied in tourism scenery, the oil wells were positioned in the base with high sides and a low center so as not to destroy the surrounding scenery. Trees were planted around so as to be harmonious with the surrounding natural scenery. The grooves were constructed between the trees and the oil wells so as to collect the rain and the crude oil may overflows during the production, BP examined and treated the collected sewage and discharge it only when it is complete harmless. During the visit, BP staff introduced the production, refinery, transportation and environmental protection of Wytch Farm Oilfield in details and said the oilfield accumulatively displayed the achievements of BP in drilling technologies and environmental protection. Wytch Farm Oilfield is the biggest offshore oilfield in west Europe, it is located in the scenery area at the south bank of Poole Harbor, the 2nd biggest natural harbor in the world and it is only two miles away from the famous Corfe Castle. There are many world cultural heritages nearby, such as the ruins of the Jurassic Coast and Purbeck Coast. The oilfield was discovered in December 1973 and began operation in 1979, the proven reserves of the oilfield is about 0.5 billion barrels, it is the 6th biggest oilfield in UK and its maximum daily yield reached 110,000 barrels of crude oil. At present, its daily yield is maintained at 65,000 barrels of crude oil, 10 million cubic feet of natural gas and 500 tons of liquefied petroleum gas (LPG). The oil source of the oilfield lies below the sand-stone of Poole Harbor and extends to the whole Poole Bay. The three independent oil sources of the oilfield lie at Frome (750 meter from the surface), Birdpoint (900 meter from the surface) and Sherwood (1,600 meter from the surface). Ms. Suzie Baverstock introduced that the local government and the neighboring communities had extremely strict requirements on the environmental protection measures for the oil extraction, there were more than 300 pages of relevant regulations and conditions, for example, the noise of the drilling equipments should measure up to the standards stipulated by the local government, the surrounding animal and plant should not be affected, the underground petroleum pipes and the ground equipments should not pollute the underground water during the operation and the air monitoring instruments should be installed near the drilling platforms. Before the development of the oilfield, BP held official meetings with the local government, legislation institutions and volunteer environmental protection organizations and the local communities and discussed on the environmental protection standards of the oilfield. BP also cooperated with the local government of Dorset and invited many members of relevant government and environmental protection organizations to set up the "Wytch Farm Oilfield Consulting Committee" to offer consultation on issues related to environmental protection. 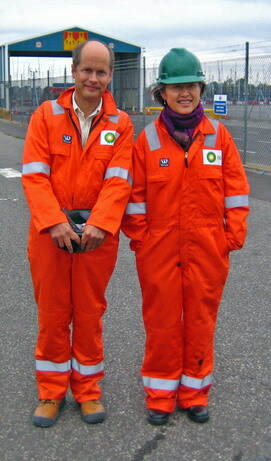 BP initiated the "Environmental Protection Manifesto" project and appointed interior environmental protection experts and environmental monitoring commissioners to carry out the environmental protection guidance and examination for the development of the oilfield, while the municipal government of Poole is responsible for the daily examination of the exterior discharge indexes of the oilfield. During the extraction process, BP paid much attention to the protection of the unique local ecological and geographical environment, it adopted such measures as investigation and research before the development, environment-friendly designs, construction monitoring, regular examination and restoration after the development so as to keep the influences of the development of the oilfield on the local environment especially the air, water, geology, physiognomy, animals and plants to the minimal level and BP won the Queens award for Environmental Achievement in 1995. In order to lessen the shock to the riverbed of Poole Harbour and the environmental impact of deep working, BP developed extended reach drilling and extended the radiation of extraction, the width could be as much as 10 km and the depth could be as much as 1,600 m. The technology not only ensured the yield of the crude oil but also reduced the amount of the drilling platforms. The extracted oil and gas were transmitted by pipelines to the refinery of BP 80 miles away (Hamber Terminal) for the refinement, the water and natural gas were separated from the oil there, the water was refilled into the oil sources while the natural gas was then sold to domestic market. The combustion gas produced during the processing of natural gas was used for the power generation in the local area while the liquefied petroleum gas was sent to all places of UK by road. Wytch Farm Oilfield has made great contributions to the economic development of UK. Fu Ying said the consciousness for environmental protection during the extraction and the extended reach drilling technology of the project were greatly impressive, BP is a leading company in the international energy field while China is developing big consumer of energy, both sides could make more exchanges and cooperation in such aspects as environmental protection and drilling technologies. Mr. John Hughes said BP paid great attention to the rapidly increasing and stable market demand of China and had set up offices in Beijing and Shanghai, BP had good cooperation with large-scale Chinese energy companies as PetroChina and invested more than 4 billion dollars in China, BP hoped to further exploit the China market and hoped to carry out strategic cooperation with major Chinese petroleum companies. Both sides also exchanged opinions on the cooperation in such aspects as environment-friendly oil extraction, clean energies and energy conservation measures.